The first time I saw the words Hoyt Axton in print I thought it might be a misprint, or an eye chart, or maybe the name of a very expensive European sports car that can go from zero to 60 in 15 seconds. But I soon learned that Hoyt Axton was an endlessly talented entertainer with a unique singing voice and a larger-than-life exuberance for living. And he was as unusual as his name. 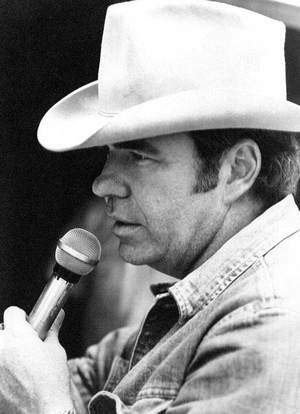 Born in Oklahoma in 1938, Hoyt was 61, as time is ordinarily counted, when he died at his Montana home in 1999. But nothing about Hoyt was ever ordinary, and if we measured life by experience rather than years, he would have been many years older. Hoyt earned millions of dollars as a songwriter, singer, artist and actor but the, everybody-knows-your-name, type of fame forever eluded him. But maybe that did not matter to him as long as his music could be heard. It was, and still is, in rock, folk, pop and country history. He could never be pinned down to one genre; he made his mark wherever he happened to land. Record companies were unsure how to categorize his music. One catalogue listed his music as "Unclassified." Hoyt's friends thought it was a totally appropriate label for the music and the man. "Hoyt had his own way of writing," said Michael Curtis, longtime band member and a songwriter in his own right whose hits include the Crosby Stills Nash and Young hit, Southern Cross. "He didn't exactly break the rules of songwriting, but he would often ignore them. He taught me a lot," Curtis added. Hoyt's career spanned more than 30 years and produced about the same number of albums; from which, a half dozen singles enjoyed widespread airplay in the US and Canada. They included When The Morning Comes, Boney Fingers, Della And The Dealer, Nashville, Wild Bull Rider, and Lion In Winter (a duet with Linda Ronstadt.) A video of Hoyt and Linda singing Lion can be viewed on www.youtube.com. Other songs from the mind and pen of Hoyt included: Greenback Dollar--Kingston Trio; The Pusher and Snowblind Friend--Steppenwolf; The No No Song--Ringo Starr; Joy To The World and Never Been To Spain--Three dog Night. Three Dog Night's version of Joy To The World topped pop charts for weeks in '71 and won "Song of the Year." More recently it was heard on the soundtrack of The Big Chill and Forrest Gump. The Pusher was on the Easy Rider soundtrack. Hoyt added acting to his resume' around 1960. One of his earliest roles, in fact it may have been his first role, was an unforgettable murderer and sociopath on Bonanza. It was a chilling performance but he really didn't like to play "bad guy" roles although he would play a few more through the years. Later television credits would include Different Strokes, Dukes of Hazard, WKRP in Cincinnati, Dallas: The Early Years, and Skinflint: A Country Christmas Carol. His movie credits included The Black Stallion, Disorganized Crime, Smokey, We're No Angels, Endangered Species, and the father in Gremlins. He was also in demand for voice-overs for commercials. Hoyt was always the center of attention in any room he entered. Tall and broad, he'd extend a hand the size of a picnic ham for you to shake, look you in the eye and beam a smile as wide as his home state of Oklahoma at you. He seemed equally at home: chatting with Johnny Carson on the Tonight Show, performing on a concert stage, regaling cast and crew with his stories on a movie set, picking and singing in someone's living room, or traveling around the country on his much-loved double decker tour bus, the Honeysuckle Rose which he bought from Commander Cody and the Lost Planet Airmen. Hoyt's father, John T. Axton, was a high school athletics coach and Hoyt excelled in sports. He made All State and earned a football scholarship to Oklahoma State University. His mother, Mae Boren Axton, a school teacher, tended to his scholarly training including classical piano lessons. Mae also wrote songs, the best known of which was something she co-wrote with Tommy Durden titled Heartbreak Hotel. Mae was a publicist in later years and would become a beloved and respected mentor to dozens of struggling artists in Nashville including Garth Brooks who honored her memory by making a $1 million donation in her name to the Nashville Zoo. Hoyt's deeply felt love of music was handed down from both parents, along with football and the piano, (which was replaced by acoustic guitar somewhere along the way.) After college, came a stint in the Navy where he was the heavyweight boxing champion over 35 ships. Wrap all this, the music, the athletics, the education, into the charismatic persona of a handsome singer/writer blessed with a baritone voice so rich it could make ripples on water, and you may, just may, begin to get a picture of the "intense" young folksinger who made an impression on the coffee house scene in San Francisco in the early 60s. Hoyt suffered a stroke in '95 that put him in a wheel chair. This was followed by other personal problems including the death of his mother, Mae, in '97. Still he continued to live each day with the optimistic outlook that was his nature. In the fall of '97 he appeared on the Crook and Chase Show on TNN and longtime friend and concert promoter, Van Barker, said Hoyt continued to talk to him about performing as soon as he felt up to touring again. Hoyt did not get to go on tour again but he left a legacy of music that will be with us for a long time. The Three Dog Night hit, Joy To The World, was much more than just a song to Hoyt--it was his philosophy. He brought it with him everywhere he went. People who knew have said he was just plain fun to be around.